Kate was a 13 year old when she presented to our office. She had a 48 degree main thoracic curve. We spoke about the fact that she had lots of growth left and her curve was in a surgical range. We did spend some time talking about some other options including bracing, Schroth physical therapy, and observation. They went to several other opinions before coming back to our office and deciding on the route of bracing and Schroth physical therapy. We were very clear that her curve had a high chance of progression but that we were willing to try the non operative approach with them if that is what they preferred. That was their preference so they went forward with being measured for a Rigo Cheneau brace and started seeing a Schroth therapist. We followed her over the next few years while she continued to have a growth spurt. She did amazing with the brace and the Schroth therapy. She is one of our most compliant and dedicated patients to the brace. She is now 17 years old and has been weaned out of the brace. She is holding steady with a 35 degree curve. 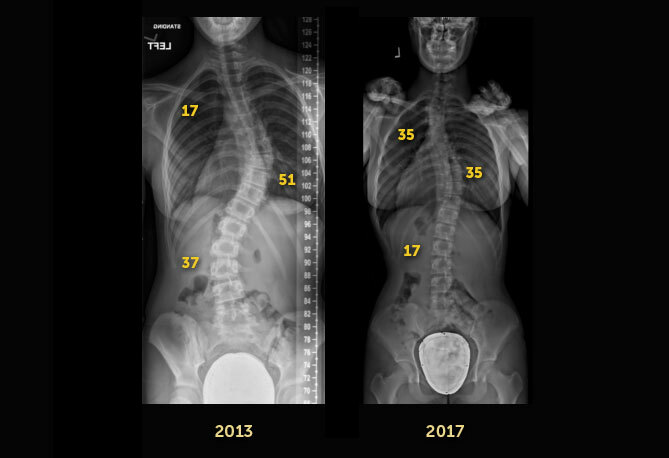 We certainly don’t expect a decrease in the curvature when we set out on the path of bracing and Schroth physical therapy but this is what occurred in this case.